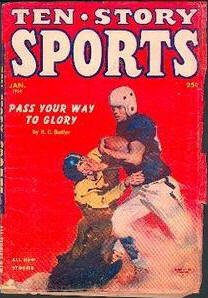 45 · Tackling Dummy · Robert Leslie Bellem · ss; wrestling. 55 · Mudder McCree · Nelson S. Bond · ss; horse racing. 76 · Ferdinand the Bull-Thrower · Eric Rober · ss; track. 88 · Bitter Victory · Jock Carroll · ss; lacrosse. 34 · Tide-Water Test · John Lockhart · ss; deep-water swimming. 69 · Suicide Saucer · Robert Leslie Bellem · ss; auto racing. 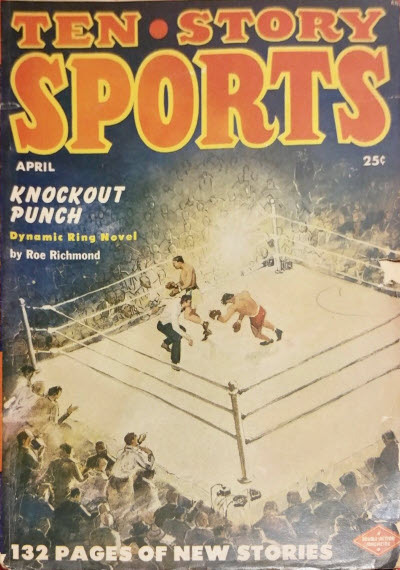 79 · Ring Rodeo · Forrest Kleinman · ss; boxing. 85 · Scooters Across America · T. W. Ford · ss; motor-scooter racing. 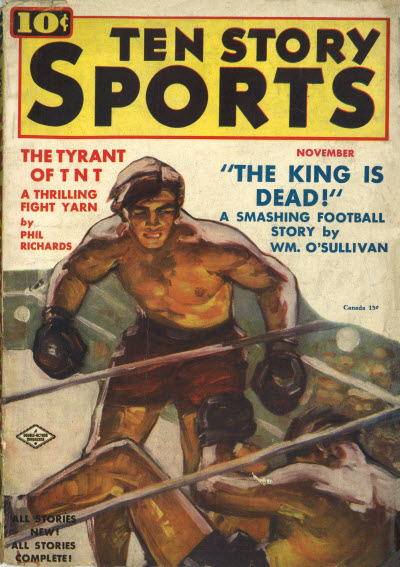 8 · The King Is Dead · William OSullivan · ss; football. 21 · The Tyrant of TNT · Phil Richards · ss; fight. 34 · Papa Comes to Alma Mater · T. W. Ford · ss; football. 47 · High Hurdle Hooligan · Zene Tuttler · ss; track. 55 · The Bench Watcher · Robert N. Bryan · ss; baseball. 68 · Calamity Crate · Walt Randall · ss; midget auto race. 75 · Homerun at Midnight · Marvin Ryerson · ss; baseball. 80 · The Racquet Reader · Theodore J. Roemer · ss; tennis. 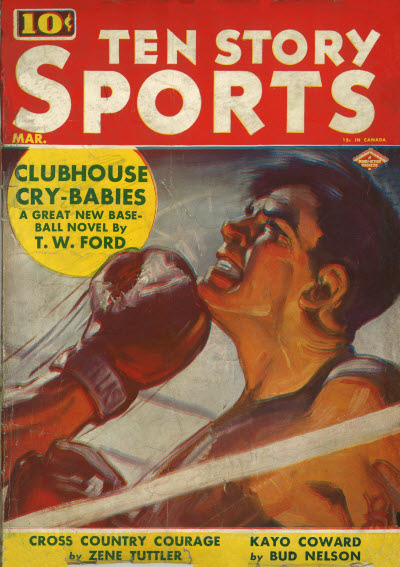 10 · Clubhouse Crybabies · T. W. Ford · nv; baseball. 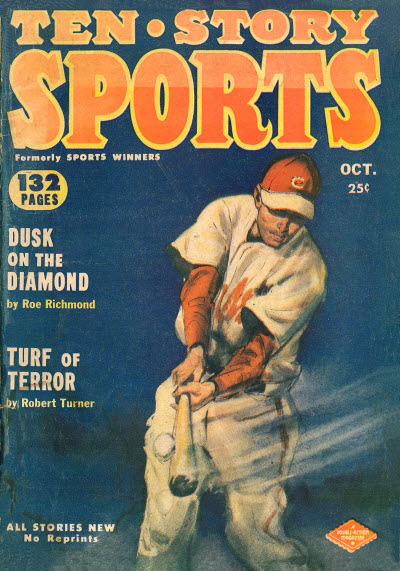 36 · Hotshot for Shortstop · Eric Rober · ss; baseball. 50 · Homicide Hank · Wilcey Earle · ss; fight. 51 · Kayo Coward · Bud Nelson · ss; fight. 68 · High Spikes for the Heller Guy · Tom Grover · ss; baseball. 85 · Cross Country Courage · Zene Tuttler · ss; cross country. 91 · Master Mind · Mat Rand · ss; baseball. Subtitled formerly Sports Winners. Details supplied by Peter Rogner. 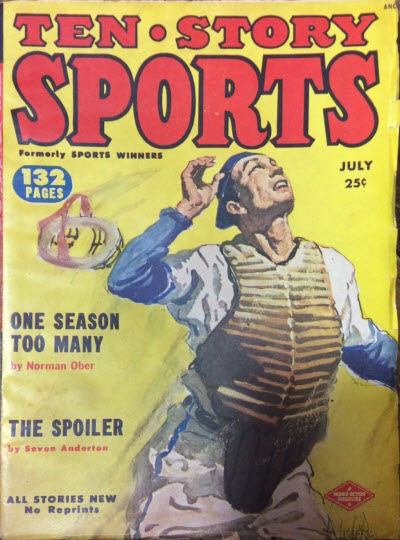 The Spoiler · Seven Anderton · na; baseball. One Season Too Many · Norman Ober · na; tennis. 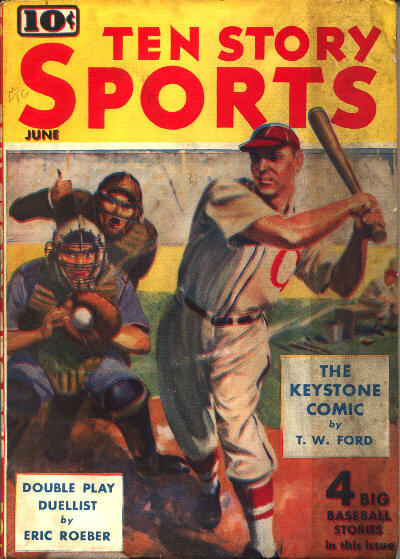 The Bonus Kid · William F. Schwartz · ss; baseball. The Rolling King · Edwin Johnson · ss; roller derby. 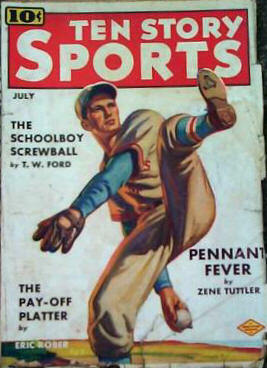 Southpaw · Lionel J. Estermann · ss; baseball. Let the Gods Decide · Hunt Collins · ss; off-trail special. Itch in the Outfield · Richard Brister · ss; baseball. 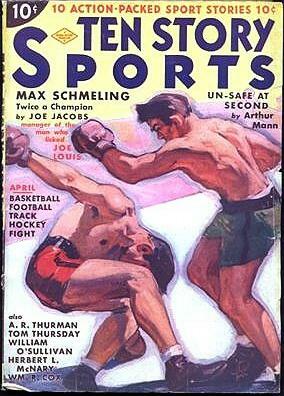 The Worlds Champions · Hal Braham · ss; fight. The Fold-Up Crew · J. J. Mathews · ss; regatta. Ghost Fighter · Robert Turner · ss; fight. Gridiron Worry-Wart · Seven Anderton · na; football. Alias Bob Carrigan · Wadsworth Nealey · ss; fight. 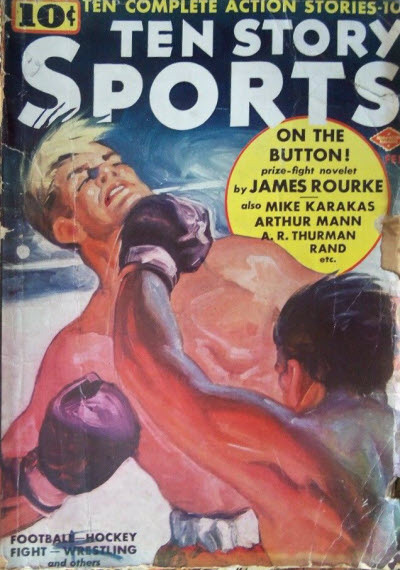 The Transformation of Big Brute Klein · William F. Schwartz · ss; football. Golf Doctor · Richard Brister · ss; golf. 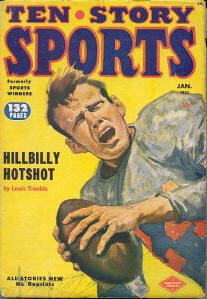 Hillbilly Hotshort · Louis Trimble · nv; football. 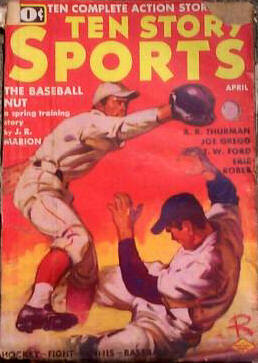 Traded Into Trouble · James L. Harte · ss; baseball. Kids Is Crazy · David James · ss; basketball. 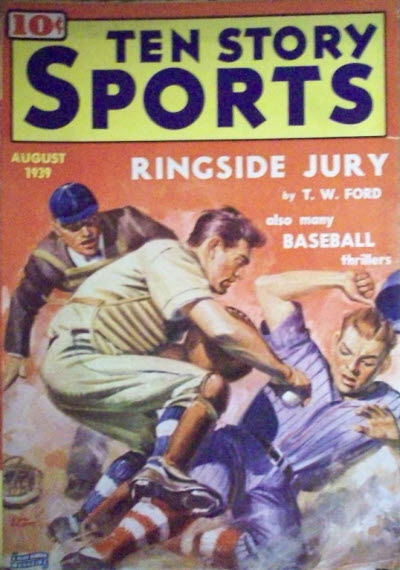 Ringer Round the Ozarks · Jim Moore · ss; baseball. 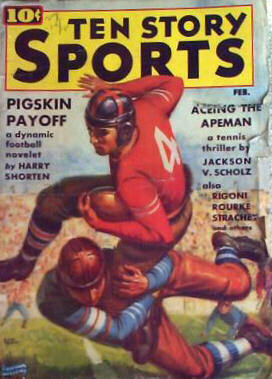 Blue Streak Guy · Norman Ober · ss; football. Knockout Punch · Roe Richmond · na; fight. 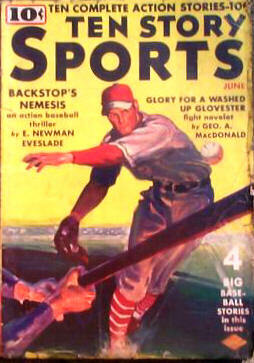 Mr. Dipsy-Do · Wadsworth Nealey · ss; baseball. The Odds Are on Bodkin · David James · ss; football. 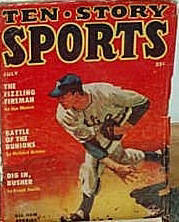 The Fading Firearm · William F. Schwartz · na; baseball. Hot Irons Arent Toys · H. Wieand Bowman · ss; auto-race. 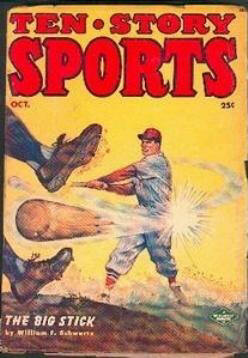 Terror at Short · J. W. Benjamin · ss; baseball. Jinx Jumper · Richard Brister · ss; high-jump. Drums Over the Diamond · Jim Moore · ss; baseball. 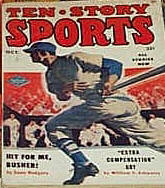 Nize Bonus Baby · Seven Anderton · na; baseball. Par None · Richard Brister · ss; golf. Lucky the Terror · David James · ss; baseball. The Passer Who Couldnt Miss · Richard Gunn · ss; football. The Weakest Link · Roe Richmond · nv; baseball. Maid in Miami · Tom Thursday · ss; fight. 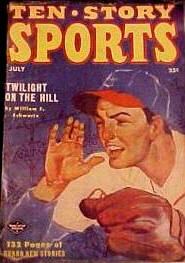 Twilight on the Hill · William F. Schwartz · nv; baseball. Killer Instinct · Jim Moore · ss; fight. Details supplied by Curt Phillips. 10 · Comeback Champs · Roe Richmond · na; baseball. 27 · Polo Pride · Lauran Paine · ss; polo. 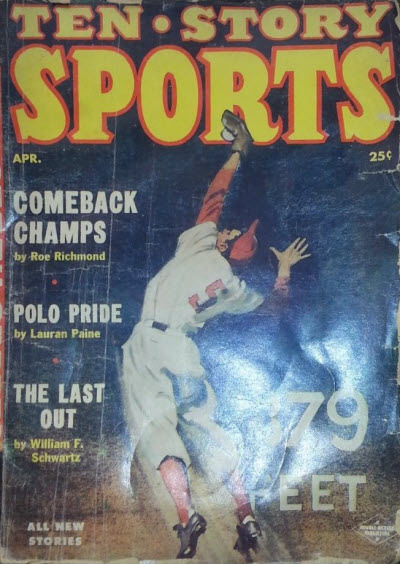 38 · The Last Out · William F. Schwartz · nv; baseball. 51 · Old Mr. Orthodox Tennis · Richard Brister · ss; tennis. 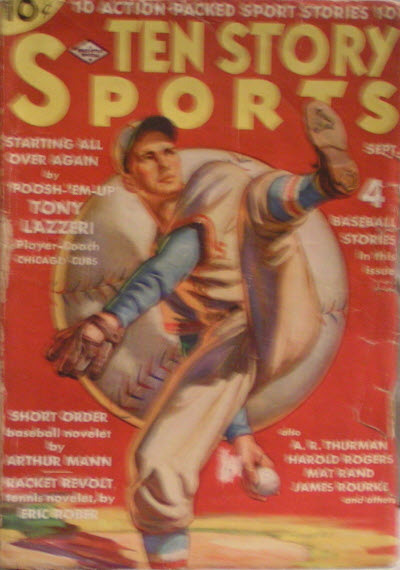 62 · The No-Heat Hurler · Mat Rand · ss; baseball. 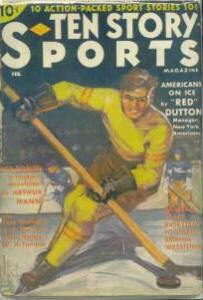 72 · Sudden Death · David James · ss; hockey. 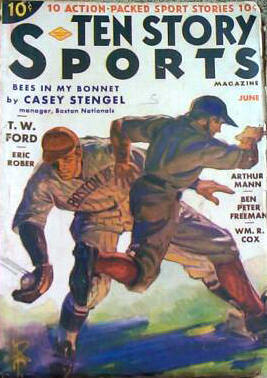 76 · The Rookie and the Pro · Gene Rodgers · ss; baseball.